Father's Day delights for the whole family! Try some scrumptious ‘breakfast in bed’ recipes and some of the lovely new recipes we have created for Father’s Day this year! Father’s Day is a great occasion to celebrate with your loved ones and get together to celebrate all the fathers out there! We have some great ‘breakfast in bed’ recipes, including Chia Berry Porridge or some delicious Blueberry Pancakes. Our new scrumptious recipe, Pinata Cupcakes, can be made in 4 easy steps and ensures family fun all day long. Also, why not make our most traditional and best-loved recipe, Ultimate Fudge, which is great for sharing and also a great homemade gift. For all our caramel lovers, try our showstopper Baked Toffee Cheesecake which provides 10 heavenly tasting slices! 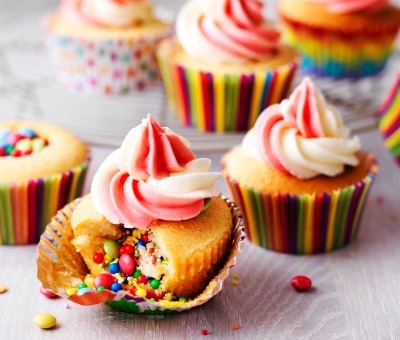 Try and make these colourful cupcakes and let the colours of the rainbow spill out to entertain the entire family! In just 10 minutes you can create this delicious ‘breakfast in bed’ recipe, topped with some fresh blueberries. Treat Dad to a special breakfast with a stack of delicious pancakes, topped with fresh blueberries and a dash of honey. Delicious with raspberries too! Being one of our oldest and most treasured recipes, we couldn’t leave it out this Father’s Day! This brilliant recipe will create 36 delicious homemade gifts. This New-York style cheesecake will make this Father’s Day more special than ever before. Have a go now and in 5 simple steps you’ll have a delicious centre piece for your family gathering. All trademarks and other intellectual property appearing on this site are owned by Société des Produits Nestlé S.A. Vevey, Switzerland. Nestlé in the UK & Ireland, 1 City Place, Gatwick RH6 0PA.